Rolodex Card A Day 310 was inspired by Magdalena Fernandez here on You Tube. Maggie was sharing her art journal. She does wonderful faces and one jumped out at me and said, "give me a try." She looked like one I needed to try. 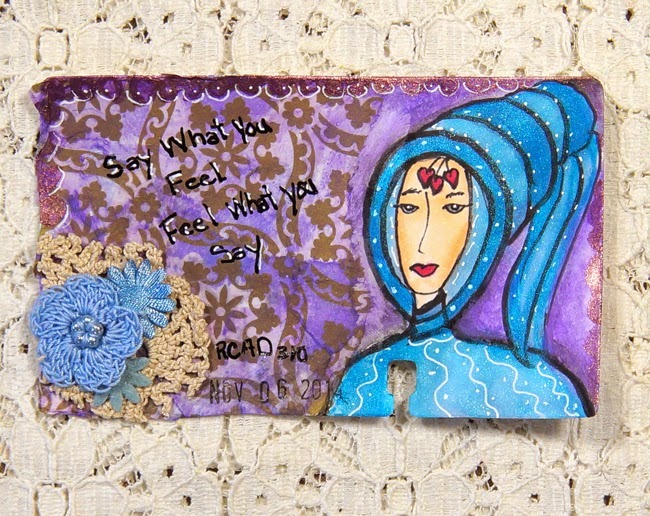 I had fun with this card and while I was creating it the words, "Say what you fell, Feel what you say." came in my head. So that is what I wrote on this card. Thank you Magdalena for the wonderful inspiration. Such a fun process and beautiful colors. My favorite is the crochet flowers.